The main rule for aid climbing is to place each aid piece as high as possible. If you make placements at 5-foot rather than 4-foot intervals, over the course of a 160-foot pitch you'll save eight placements, many more carabiners, and much time. Most of the techniques for placing free-climb-ing protection apply to aid climbing. For aid climbing, if possible, you'll shorten the slings to your pieces and often use hero loops on fixed protection rather than clipping in directly with a carabiner. Placing small nuts during an aid climb is similar to placing larger ones on a free climb. But because aid nuts take the weight of the lead climber and because they may be smaller than the chock pick, they can be difficult to remove. If you place small nuts near the outside of the crack, they will be easier to remove and there will be less danger of damaging them in the process. Test small nuts gently before committing your weight to them. Fixed pins, bolts, or rivets must be evaluated before use (see Chapter 10). If you decide to use a fixed piece, thread a hero loop through its eye and clip a single carabiner into the two ends of the loop. This saves a carabiner. Note: use a direct carabiner clip-in every three or four pieces as a backup. The hero-looped pieces are not as safe for stopping a fall because of the danger the loop could be cut by the edge of the metal eye. It's also wise to carry a few bolt hangers and nuts (in both 174-inch and 3/8-inch sizes) for bolts with missing or damaged hangers. • Horizontal placement of pins is generally more secure than vertical placement because rotation is reduced or eliminated. • Ideally, the eye should point downward. • As with chocks, place pins in locally wider portions of a crack. If the crack is thinner below and above the pin, the pin will be supported when it has to take a climber's weight. • A properly sized pin can be placed one-half to two-thirds of the way by hand. The remainder of the pin is hammered in place. Select the correct pin to fit the crack. Don't try to make the crack fit the pin; this practice causes needless destruction of the rock. • A sound piton rings with a higher-pitched "ping" with each strike of the hammer. After the pin is driven, tap it to test for rotation. Rotation indicates the pin is not biting the rock. Replace such pins with a larger size. • Knowing just how much to hammer a piton is a matter of touch and experience. Excessive hammering wastes energy, makes it harder for the second to remove the piton, and needlessly damages the rock. Under-driving a piton, however, increases the risk of it pulling out. If several pins are under-driven, the failure of one could result in a long fall as the series of pins zippers out. • When possible, avoid placing a pin in a three-way corner. Such placements are often impossible to clean because the pin cannot be tapped back and forth for removal. Just leave it as a fixed pin. 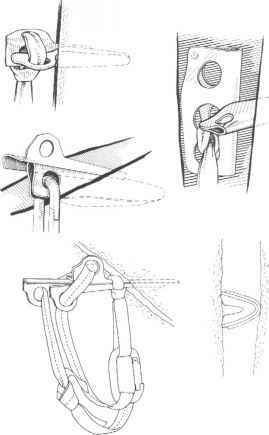 • If the position of the piton causes the connecting carabiner to extend over an edge, add a hero loop to the piece (fig. 11-14). This prevents loading the carabiner across its sides. 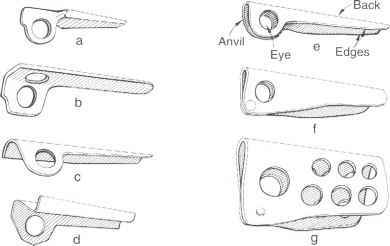 • On overhangs, place pins with some horizontal orientation when possible (fig. 11-15). This reduces the odds of total failure should the pin shift when weighted. • Place knifeblades in vertical cracks with the offset eye down. • When placing angles, keep the three points of the V in contact with the rock (fig. 11-16). The back (point of the V) always must contact one wall, while the edges (two tips of the V) contact the opposing wall. In a horizontal crack, put the back of the angle up and the edges down. Fig. 11-14. 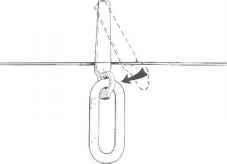 Safely extending a piton; right figure eliminates side loading the carabiner. and you can add a sling to a bong before using it that way. • Expanding cracks present problems for pins because as subsequent pins are placed, lower ones loosen. When possible, use chocks in such situations, because they minimize flake expansion. If pins must be used, try to work with long minimum-taper pins placed lightly in natural slots, to minimize expansion of the rock flake. Fig. 11-18. Sawed-off piton driven over a Stopper; note the non-load-bearing keeper sling on the Stopper. Fig. 11-17. Bong placements: a, driven and tied off through lightening holes; b and c, girth-hitched for use as a large chock. duces the levering action on the pin (fig. 11-19). Bongs can be tied off through their lightening holes. Loop a longer keeper sling (or a second carabiner) through the eye of the pin and clip it into the hero loop or hero-loop carabiner. The keeper sling doesn't bear weight, but will catch your pin if it pops. Fig. 11-19. Tied-off piton; note the use of a keeper sling through the piton eye. When no single pin or chock fits the crack at hand, aid climbing gets very creative. Whether you've run out of the proper-sized pieces or are facing a shallow flaring crack, it's time to improvise by stacking or nesting your hardware in whatever combination works (fig. 11-20). Blades are nested back to back and are usually driven together. If a third blade is necessary, the first two are inserted by hand, and then the third is driven in between. Some disagreement exists about the best way to stack angles. Most climbers stack them by keeping the backs of both angles against the rock, but any combination will work. Try to avoid stacking angles by simply placing one over the other, as these may be very hard to separate once removed. Leeper Z pitons are especially useful in stacking. Fig. 11-20. Examples of pitons stacked and nested (some keeper slings omitted for clarity); inset, angles stacked over each other. crack. Then, the pin is inserted to anchor the chock or wire and to create an artificial wall against which the chock or wire can cam. You can often achieve a solid aid placement this way with minimal use of the hammer. Note, however, that wires used this way wear quickly. These special combinations present another situation that requires non-load-bearing keeper slings to catch any pitons should the placement fail. F/g. 11-21. Camming combinations: a, piton and chock; b, piton and wire hanger (keeper sling omitted for clarity). sling will prevent the loss of your gear if the hook pops off its purchase. Now set the hook on the ledge, flake, or hole where it will be used. Test it gently before applying full body weight (or gently "ooze" onto the hook). Avoid standing with your face directly in front of the hook because it could pop out with a good deal of force. 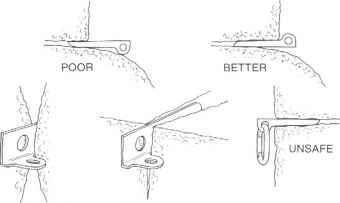 If the hook is used in a shallow bolt hole, a very slight tap to set the point is sometimes useful. However, this practice increases the possibility the hook will pop out. It also erodes the existing hole, and eventually a bolt will need to be placed. Fig. 11-22. Placing a malleable piece: a, place it; b, "X" it; c, paste it; d, rotate test it. Because you often can't tell how secure they are, do not use malleable heads unless you're dealing with a pocket or flare where other protection just won't work. Copperheads, aluma-heads, and circleheads take more practice to place than other types of aid and require some specialized tools. The hammer pick works for setting large heads, but small heads require a striking tool like a blunt chisel or, in a pinch, a lost arrow. 1. Place it. Insert a head as you would a chock— in a narrowing portion of a flare or seam. 2. "X" it. Pound it in using angled strokes that form an X pattern on the head. 3. Paste it. Now pound the right and left sides to "pin" the head. 4. Rotate it. Hit the bottom and top to see if the head rotates. If so, X it and paste it again. 5. Sniff it. If the head emits a metallic odor, it is under-driven or over-driven; do not use it. The smell arises from the cutting or cracking of the head rather than its molding to the rock. 6. Use it. Heads are used like any other aid piece—but remember their inescapable weakness. Inspection cannot guarantee the molding of the head to the rock. Some heads may hold a short fall, others will just support body weight, and others might fail. All malleable-head placements are suspect, and an acceptance of this fact is inherent in their use. What is a carabiner keeper pin used for?